It’s a big wide world out there. And there’s a lot of distance to cover. So when organisations are large and spread far and wide, company communications and unity can suffer. You need technology that closes the gap. That allows you to collaborate across multiple sites, wherever they are, and whenever it’s needed. You need communication technology that helps you to move beyond boundaries. create world-leading systems, tailored to meet the specific needs of multi-site organisations. 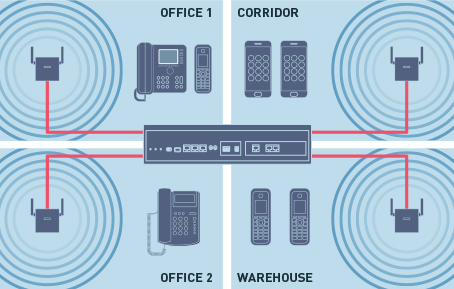 Our IP cell stations allow you to connect your Private Branch Exchange (PBX) via your LAN. There’s no need to install a further PBX at your branch office or buildings, just a simple and cost-effective IP cell station. Flexible and remote working is becoming, and will continue to become, increasingly vital for business success and talent retention. That’s why Panasonic’s Media Relay Gateway (MRG) function enables the simple installation of IP phones in locations distant from your main office, by connecting via an IP network. 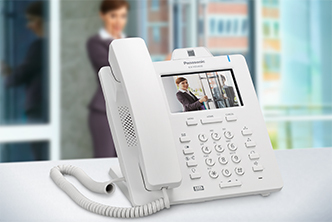 What’s more, thanks to Panasonic’s Wireless XDP Parallel function, workers can use the same extension number whether they’re at home or in the office, so important calls are never missed. Our Smart Desk function also allows multiple users to share the same extension. Users simply apply their own profile with a service-in operation to receive personal calls and voicemail. Once they have serviced-out, the extension becomes available for another employee. Using Panasonic’s NSX series of unified communications platforms (and depending on their licence), each user can assign a single phone number to a number of devices such as their office and mobile phones, meaning they can easily be used as an office extension. In other words, employees can manage multiple devices spread over various locations using a single number. Thanks to 1+1 Redundancy, should there be a failure in the master or ‘working’ unit, a backup unit will temporarily continue communication services without a hitch. For up to 30 days in fact. Equally, should network trouble occur across a multi-site connection, a Survival Gateway feature will automatically operate Simplified Isolated Mode – allowing each site system to continue to operate independently, undisturbed. Using IP networking and Panasonic’s My Portal web interface, organisations, even when spread across multiple locations, can perform remote management and programming from a single central site. It’s straightforward, more efficient, and negates the need for an administrator at every site, significantly lowering operational costs. 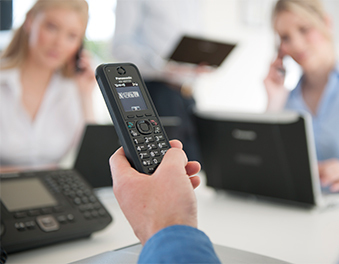 Panasonic’s PBX technology not only eliminates expensive phone bills and line rental, but delivers innovative call management functions that save valuable time and save on operator costs. Our systems support easy and secure remote access for installers, integrators and engineers through remote maintenance and KMS servers that exist on a dedicated Panasonic Cloud. Should a system error occur for example, packet trace data is easily retrievable for analysis, as are operation and IP-PT VoIP-quality logs. Thanks to Panasonic technology, recovery and maintenance is quick, flexible and efficient. And can be carried out at anytime, from anywhere. Our technologies can be combined to create entire multi-site video and monitoring communication suites, using IP networking.